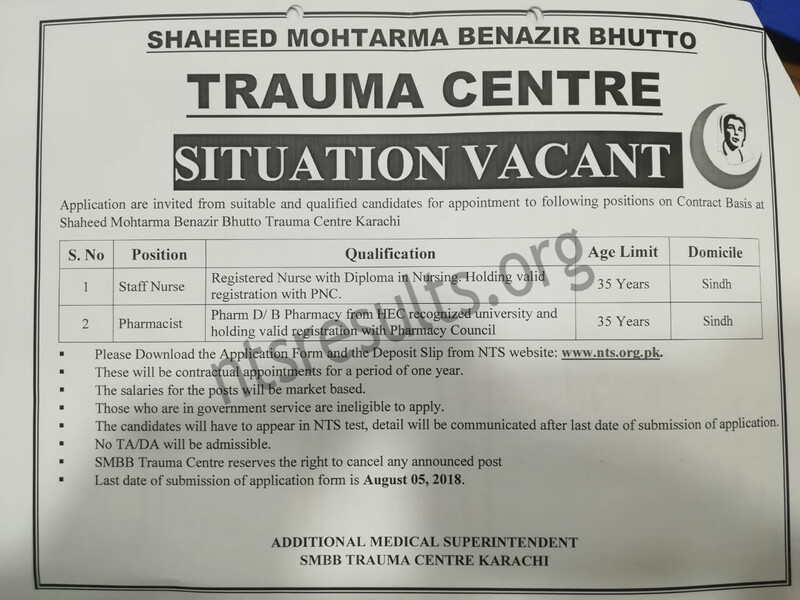 Application forms are available here for Shaheed Mohtarma Benazir Bhutto Trauma Center Karachi Jobs Via NTS. Last date to apply is Sunday, 5th August 2018. The jobs in the SMBB Trauma Center are for the posts of Staff Nurse and Pharmacist. In order to meet the challenges of management of Trauma related emergencies. It became important for the Health Department, Govt of Sindh to visualize future needs as well as to establish a specialized facility of emergency healthcare and trauma management, complying the standard criteria of level 1 Trauma Centre. Moreover capacity of in-house training for personal are also available in SMBB Trauma Center. In Shaheed Mohtarma Benazir Bhutto Trauma Center Karach their are 500 beds for different Specialty Emergency Care and Management. Application are inviting from suitable and qualified candidates for appointments of Staff Nurse and Pharmacist on contract basis. Those candidates who have domicile of Sindh are eligible to apply. Maximum age require for the jobs in SMBB Trauma Center is 35 years.The jobs in the Trauma Center Karachi SMBB are offer on contract period for the duration of 1 year. Terms & conditions as well as other requirements for Shaheed Mohtarma Benazir Bhutto Trauma Center Karachi Jobs Via NTS are describe below. Candidates can download the application form and deposit slip from the NTS website. Application form is also available here. Government employers are not eligible to apply. SMBB Trauma Center jobs are on contract basis for the period of 1 year. Last date of submission of application is 5th August, Sunday, 2018.